The heavyweights came out to play with 4 "V" drivers joined by 98P Craig Humphries, 72P Simon Joblin, 9P Brett Hyslop, 4P Chad Ace, 89S Sandy Flett, 45S Stephen Guilford and 82S Paul Johnson. Racing was hard and fast with some impressive times logged by the likes of Hyslop and Ace. Wins were surprisingly taken by the locals with Ant Cooper having a spin in the Doyle 51V car logging a first then 5V Darryl Taylor returning to the groove with a couple of wins, including the feature. The feature should have been Cooper's but he got it all wrong in the final turn resulting in a huge punt up the rear that allowed Taylor to take the lollies. 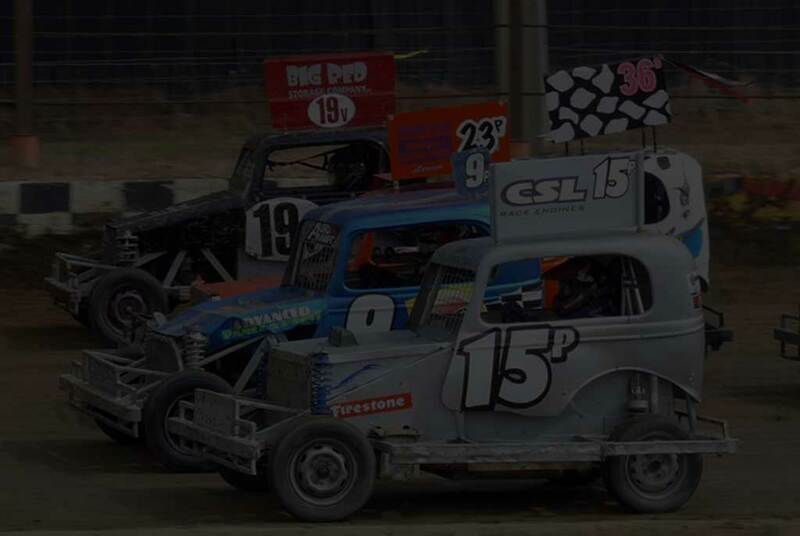 Cooper returned to take the Grand Slam ahead of Guilford and the impressive stockcar peddler 15V Kyle Heibner who completed a nice move on the Superstock of 35V Mick Paul to claim third. Race One: 1. 51V Ant Cooper. 2. 89S Sandy Flett. 3. 5V Darryl Taylor. 4. 72P Simon Joblin. 5. 9P Brett Hyslop. 6. 45S Stephen Guilford. Race Two: 1. 5V. 2. 45S. 3. 9P. 4. 4P Chard Ace. 5. 98P Craig Humphries. 6. 89S. Feature: 1. 5V. 2. 51V. 3. 45S. 4. 89S. 5. 9P. 6. 35V Mick Paul.